BPI Dares Shoppers Away From Cash - Hello! Welcome to my blog! The Bank of the Philippine Islands is doing something daring – challenging clients to move away from their payments comfort zone by skipping the cash. Instead, shoppers can pay direct using their BPI Express Teller Debit (ATM) Cards through the Express Payment System (E.P.S.). In doing so, the country’s first bank hopes to create a shopping experience that foregoes the different hassles of using cash to pay. Dare to SKIP that additional line. The common starting point of a shopper’s experience is at an ATM. Usually this involves the shopper finding himself at the back of a significantly long line to withdraw cash. By using BPI Debit Cards to pay, customers can experience at least one length of a line less and can go straight to their shopping. Dare to SKIP the risks. Once withdrawal is complete, the shopper now finds himself with more cash in his pockets. This exposes the shopper to the risks of losing his cash by misplacing it or, in some cases, theft. When you pay using BPI Debit Cards, not only do you skip the risk of carrying cash, but you also skip to a more secure way of shopping, as each debit transaction is authenticated with your ATM PIN. Dare to SKIP counting. Shoppers who pay with cash have to go through the extra step of counting their payment and their change. This adds time to the transaction, and is very open to mistakes. This can be avoided when paying through BPI Debit Cards, where only the exact amount is paid by the shopper each and every time. Dare to SKIP the weight. The average weight of a 5 Peso and 1 Peso coin is 7.7g and 6.1g respectively. Individually these may seem light, but when accumulated, coins can add significant weight to a shopper’s pocket or bag. This inconvenience can easily be avoided when shoppers use their BPI Debit Card to pay. A plastic debit card normally weighs less than 5g. Dare to SKIP the “disappearing” cash. Often times, cash “disappears” from pockets because shoppers fail to account for their spend. This is especially true when it comes to impulse buys and small-ticket items. The usual result of this is spending more than what was budgeted, making it difficult for cash-based spenders to save. When using BPI Debit Cards, on the other hand, shoppers can check their full transaction history in BPI Express Online. When paying through BPI Point-of-Sale (POS) terminals, shoppers even have the added feature of seeing where exactly their purchase was made through BPI Express Online. Dare to SKIP the Cash with BPI Debit Cards. 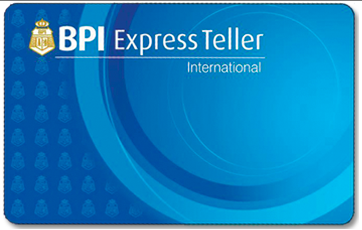 Shoppers need only shop, swipe their BPI Debit Cards and key-in their ATM PIN to complete a transaction through E.P.S. This allows them to skip all the hassles of a cash transaction, making for a better shopping experience. Today, more than a million BPI customers already use their BPI Debit Cards to pay when they shop. Will you join the millions of customers who already found a better way to pay than cash? Would you dare to SKIP? BPI dares you.